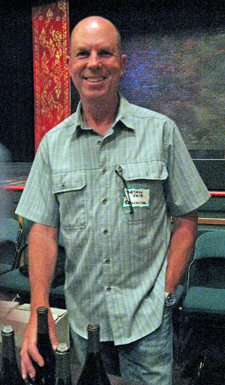 Report on the 11th Marin County Wine Celebration presented by the Marin County Winegrowers Association, held on Sunday, June 26th, 2016, at the Throckmorton Theatre in Mill Valley, California. The event focuses on wines from the Marin County AVA. The Marin County Winegrowers Association promotes wines from the county, and supports cooperation among growers and wineries. It helps to raise awareness of Marin’s wine history as well as of its current wineries and wines. The event this year also served as a benefit for the Throckmorton Theatre’s Arts and Education programs, and included a silent auction of selected Marin County wines. Marin County is located just north across the Golden Gate from San Francisco and south of Sonoma County. With the Pacific Ocean to the west and San Francisco Bay to the east, the maritime influence on the climate helps make Marin one of the cooler growing areas for winegrapes in California. Winegrape growing in Marin dates well back into the nineteenth century, though it’s always been a very small-scale industry compared with other agriculture in the county. The earliest post-Prohibition commercial plantings date from the end of the 1960s, with Pacheco Ranch becoming the first bonded winery since Prohibition in the early 1970s. Even today, commercial winegrape growing is tiny in scale, with less than 200 acres planted throughout Marin. Wines labeled as being from Marin County were virtually unknown until Pinot Noir bottlings from Vision Cellars (from Chileno Valley Vineyard) in 1997 and Dutton-Goldfield (from Devil’s Gulch Ranch) in 2000. 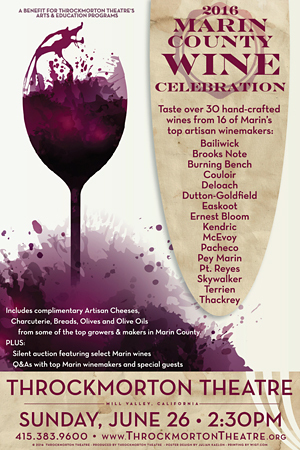 After a year’s hiatus, it was great to have the Marin County Wine Celebration back. 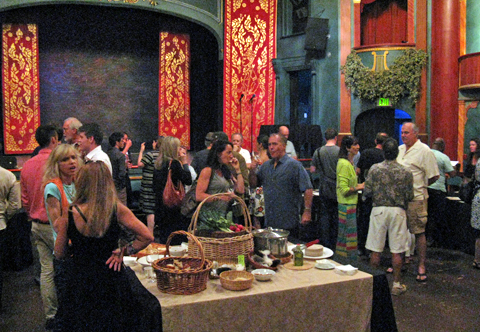 The event was promoted noticeably better this year than it was two years ago, and it was in a nicer venue, the beautiful and historic Throckmorton Theatre in downtown Mill Valley. The result was far better attendance than the tasting two years ago – good to see that interest in Marin County wines continues. As has been the case at past Marin County Wine Celebrations, there was a spread of delicious Marin-produced food available to enjoy. There were cheeses from Cowgirl Creamery, Point Reyes Farmstead Cheese, and Nicasio Valley Cheese Company, charcuterie from Devil’s Gulch Ranch, breads from Brick Maiden Bakery and Bovine Bakery, and olives and olive oils from McEvoy Ranch. Winery tables were set up around the perimeter of the modestly-sized theater, with a large food table in the center. It was easy to find specific producers, and there was plenty of room to circulate throughout the space. Lighting was kept on the low side to help prevent the space from getting too warm, and although it did heat up somewhat by later in the afternoon, it never got too hot inside. Midway through the afternoon tasting, there was a brief introduction and talk by three noted Marin growers and vintners – Mark Pasternak of Devil’s Gulch Ranch, Stewart Johnson of Kendric Vineyards, and Blake Yarger of McEvoy Ranch. Thanks to staff and volunteers, everything ran smoothly throughout the afternoon. This event provides a unique opportunity to sample wines sourced from Marin County fruit. As always, the producers included many based outside of Marin – there are only a handful of wineries actually located within the county. A total of 16 producers were represented at the tasting this year. Most were on hand to pour their own wines, while Mark Pasternak – who farms several of Marin’s best-known vineyards including Chileno Valley Vineyard in addition to his own – poured wines for three of them (Easkoot, Earnest Bloom, and Terrien) at one table. An interesting development that could be just around the corner for some Marin vineyards is the official approval of the Petaluma Gap AVA. A number of northern Marin vineyards – including Azaya, Chileno Valley, Kendric, McEvoy Ranch, and Stubbs – will be within the Petaluma Gap appellation, which will cover parts of Marin and Sonoma counties. While Pinot Noir remains Marin’s hallmark grape, there have been a few other varieties that have been grown there for a number of years. Chardonnay and Riesling do well in the cooler climate of northern and western Marin, while the warmer eastern side of the county is home to its oldest current commercial vines – Cabernet Sauvignon planted in the late 1960s. Other more recent plantings include Viognier, Syrah, Grenache, Mourvèdre, Barbera, Montepulciano, Refosco, and Alicante Bouschet, and it sounds like other varieties may be on the way soon. The Marin County Wine Celebration is a fairly small event, so I had time to get to all of the winery tables and I believe I tried every wine that was poured there. Not surprisingly, Pinot Noirs dominated the tasting, with smaller numbers of whites, rosés, and other red varieties and blends. Most of the whites and rosés were from the 2014 and 2015 vintages, while current-release Pinots were mostly from the very good 2013 and 2014 vintages, although there were also a few current releases from 2012. Several of the still-available older Cabernet Sauvignons were surprisingly good, with a couple from the 2005 vintage that were standouts. The overall quality of wines produced from Marin County fruit continues to get better. The first couple of times I attended this event, in 2009 and 2010, tasting wines from Marin seemed almost more of a novelty than anything else, with only a handful of standout wines. But in the years since, the wines have improved across the board with many more highlights. I feel this reflects improvements on both the growing and winemaking sides over the years, and the area’s vineyards seem to be attracting increasing attention of talented vintners. Most of those pouring at the tasting presented strong wine line-ups, and all of them poured at least one standout wine. It’s tough to pick favorite producers at a tasting such as this one, since most poured only two or three wines, and some of those were multiple vintages of the same bottling. But given the small sampling size, it’s still notable that all the wines from a few vintners made it onto my list of Favorites. This year was a return to form for the Marin County Wine Celebration, with great attendance at a fine new venue, and more standout wines than ever. The potential of winegrapes grown in Marin County has never been more apparent, and I believe we’ll see the wines from Marin fruit continue to improve in the coming years. The Marin County Wine Celebration continues to showcase the steady progress that these wines are making, and it’s an event that fans of cool-climate California wines should not miss. Bailiwick is the label of brothers Bryan and Paul Vais, and their first releases were from the 2009 vintage. In addition to their “Borderline” Marin Pinot Noir, they also make several Pinots from other appellations, and produce Vermentino and Cabernet Franc as well. They make their wines in Sonoma. Bryan was on hand to pour two vintages of their Marin Pinot – 2012 “Borderline” Pinot Noir and 2013 “Borderline” Pinot Noir. Both featured fruit sourced from Chileno Valley Vineyard and Kendric Vineyard, with 667 and 777 Pinot clones. The 2012 was fermented with 12% whole clusters and aged in 33% new French oak. This had aromas of black cherry, spice, tea leaf, and earth, with a lively mouthfeel and finish. The 2013 was my favorite of the two, and one of the highlight Pinots of the tasting – this one had 22% whole-cluster fermentation and 25% new French oak. Displaying more floral character on the nose along with bright red fruit, forest floor, spice, and a hint of wet stones, with a more structured texture than the 2012 but fine tannins on the finish. Bailiwick’s “Borderline” Pinots have always been strong, and the 2013 may be their best yet. 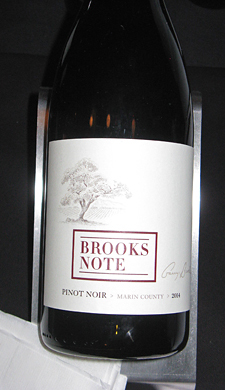 Brooks Note is a fairly new winery, founded in 2011 by Garry Brooks and his wife Joanne. Garry has worked for Ravenswood, Acacia, Kosta Browne, and Dutton-Goldfield, which is where he was introduced to Marin County vineyard sources. The focus so far has been on Chardonnay, Pinot Noir, and Pinot Rosé. Garry poured me a vertical of his three Marin Pinots – 2012 Marin County Pinot Noir, 2013 Marin County Pinot Noir, and 2014 Marin County Pinot Noir (pre-release). Fruit sources have been Azaya and Chileno Valley vineyards, with percentages changing a bit from year to year, and the wines are typically made with around 10% whole-cluster fermentation and 30% new French oak. The 2012 displayed ripe and spicy fruit along with earth and sweet oak, with a fairly structured mouthfeel but refined tannins. The 2013 was my favorite of the three, from 2A and 777 clones at Azaya and 828 clone at Chileno Valley – bright red fruit, tea leaf, forest floor, and spice on the nose, with a lively and elegant texture and fine tannins on the long finish. The 2014 showed riper and more intense black cherry aromatics, with a bigger herb component along with earth, vanilla/oak and an interesting saline note, plus good structure and grippier tannic finish – has potential but needs more time. 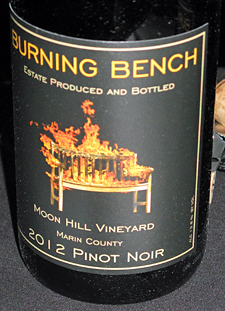 The fruit for Burning Bench comes from proprietor David Mease’s estate Moon Hill Vineyard, in the hills between San Geronimo and Nicasio. First planted in 2002, the small vineyard includes 115, 667, 777, and 828 Pinot clones. David poured two vintages of the wine – 2012 Moon Hill Vineyard Pinot Noir and 2013 Moon Hill Vineyard Pinot Noir. The wines are fermented with native yeast, generally using around 25-30% whole clusters, receive about one week of extended maceration, and are aged in about 20% new oak. The 2012 Pinot Noir had ripe black cherry aromas along with spice and earth, with medium acidity, and lots of spice on the finish. I preferred the 2013, with brighter red fruit, tea leaf, and spice on the nose plus hints of flowers and earth, a lively mouthfeel and fine tannins – tasty now and should develop nicely with short- to mid-term cellaring. Couloir is the label of Jon Grant. 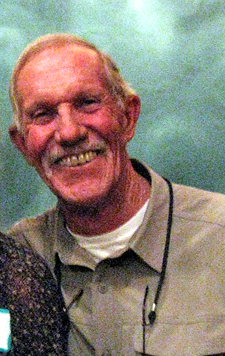 A veteran of Napa wineries such as Turley, PlumpJack, Corison, and Robert Mondavi, he launched Couloir with the 2007 vintage. The Couloir label focuses exclusively on single-vineyard designate Pinot Noir, while Jon’s Straight Line labels is for other varieties as well as appellation-designate Pinots. Jon has made a Chileno Valley Vineyard Pinot Noir since 2009. He was on hand at the tasting and poured two wines – Straight Line 2015 Devil’s Gulch Ranch Chardonnay and Couloir 2013 Chileno Valley Vineyard Pinot Noir. The Chardonnay, sourced from vines planted in 1981, is a rare bottling of this variety from Devil’s Gulch. Barrel-fermented in neutral oak, this had bright citrus, floral, and herbal aromas with a stony mineral note, vibrant acidity on the palate, and a long, clean finish. The Pinot was fermented with 25% whole clusters and aged in 35% new French oak. Showing earth and herbs upfront with cherry and strawberry fruit and spice in support, a lively mouthfeel with good structure, and a stony mineral note along with moderate tannins on the finish. Two nice wines that should benefit from some time in the cellar. DeLoach, owned by the Boisset family since 2003, has long been known for its Sonoma County wines, particularly those from Russian River Valley. Starting with the 2009 vintage, the winery branched out into wines from Marin County fruit. Winemaker Dan Goldfield, who has many years of experience with Marin fruit, has worked with DeLoach on their Marin County wines. 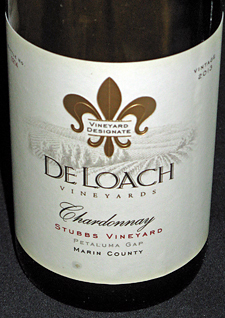 I tasted two wines at the DeLoach table – 2013 Stubbs Vineyard Chardonnay and 2013 Marin County Pinot Noir. Stubbs is one of the coldest vineyard sites in Marin, and this Chardonnay displayed bright pear and stone fruit, spice, and vanilla/oak on the nose, with a creamy yet lively mouthfeel and slightly chalky finish. The Pinot was sourced from Stubbs and Chileno Valley vineyards, with black cherry, spice, and forest floor aromas, a silky texture, with moderate tannins – drinking well now, and there seems little reason to wait on this one. Dutton-Goldfield has one of the longest track records for making wine from Marin County fruit, and Dan Goldfield’s Pinots from Devil’s Gulch Ranch helped put Marin County wines on the map. Today, the winery produces two Marin Pinots as well as a Riesling. 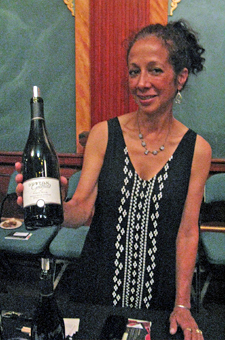 Valerie Wathen of Dutton-Goldfield was on hand at the tasting, and she poured me all three of these wines – 2014 Chileno Valley Vineyard Riesling, 2014 Azaya Ranch Pinot Noir, and 2014 Devil’s Gulch Ranch Pinot Noir. 2012 was the first vintage for the winery’s Chileno Valley Riesling and Azaya Pinot, though they’ve made a Devil’s Gulch Pinot since 2000. The Riesling had subtle citrus and petrol aromas plus floral undertones, with a moderately rich yet lively mouthfeel and a dry, slightly chalky mineral finish. The Azaya Ranch Pinot featured ripe cherry, earth, tea leaf, and stony mineral notes, with bright acidity and fine tannins. The Devil’s Gulch Pinot Noir showed black cherry and plum aromas with an earthy, mushroomy component and touch of spice, with a bigger structure and firmer tannins than the Azaya bottling – this will need some cellaring to show its best. This was a strong group of wines from Dutton-Goldfield. Ernest Bloom is a fairly new label, but the winery owners are well-known – Anne Moller-Racke, noted for her work at Donum Estate, and T.J. Evans, winemaker at Domaine Carneros. 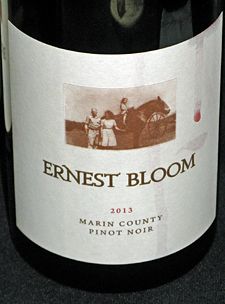 Mark Pasternak poured Ernest Bloom’s one wine at the tasting – 2013 Marin County Pinot Noir. Sourced from Chileno Valley Vineyard, this had lots of upfront spice aromas along with bright red fruit, tea leaf, forest floor, and a stony mineral note, medium weight with vibrant acidity and a clean finish, nice. 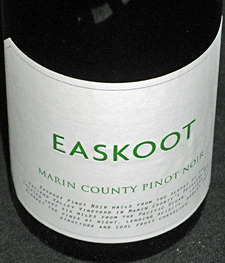 Easkoot specializes in cool-climate Pinot Noir, and their first release was a 2009 Marin County Pinot. Owners Stephan and Emily Schindler work with winemaker Matt Duffy on the Easkoot wines, and they also own a wine import company, Winemonger. Mark Pasternak poured the lone Easkoot wine at the tasting, sourced from Chileno Valley Vineyard – 2014 Marin County Pinot Noir. Fermented with 20% whole clusters and aged in just 8% new French oak, this featured bright black cherry aromas along plus floral notes, earth, dried herbs, and spice, with medium body, a lively texture, and fine tannins. This is a nice young Pinot with good potential for medium-term cellaring. Stewart Johnson’s estate vineyard, on the northern edge of Marin, is planted mostly to seven clones of Pinot Noir. Kendric’s first Viognier was from the 2012 vintage, sourced from a small part of the estate vineyard grafted to that variety in 2011. Stewart makes his wines on Treasure Island in San Francisco Bay. (Disclosure – I’ve helped bottle some of the Kendric wines) I tasted four wines at the Kendric table – 2014 Marin County Viognier, 2013 Marin County Pinot Noir, 2012 “Reserve” Marin County Pinot Noir, and 2009 Marin County Pinot Noir. The Viognier was lightly floral with stone fruit and citrus aromas, and showed a touch of spritz in the mouth. The 2013 Pinot was a standout, with bright cherry fruit along plus rhubarb, spice, tea leaf, and earth, good structure and refined tannins with a stony mineral note on the finish. The 2012 “Reserve” Pinot Noir had less upfront fruit with bigger earth, savory herb, and sweet oak components, a richer mouthfeel with bigger structure and firmer tannins – promising but in need of more time in the cellar. Stewart typically brings an older vintage or two of his Pinot, and the 2009 displayed brighter and slightly higher-toned red fruit, along with earth and tea leaf on the nose, lively acidity and mildly chalky tannins on the finish, developing nicely. Kendric continues to make some the most appealing of the Marin County Pinots I’ve tried over the years. Long-known for their fine olive oil, McEvoy Ranch planted about 8½ acres of their land with grapevines in 2006, starting with Pinot Noir, Syrah, Montepulciano, Grenache, Viognier, Alicante Bouschet, and Refosco. Since 2012, McEvoy Ranch has also taken over farming 19 acres of vines at Azaya Ranch. The wines are made at their home ranch, and Blake Yarger heads up the winemaking team. Blake was on hand at the tasting, and he poured me three wines – 2012 “The Evening Standard” Estate Pinot Noir, 2011 Estate “Red Piano,” and 2012 Estate “Red Piano.” The Pinot is a 50/50 blend from each of the two estate vineyards, and displayed bright red cherry and rhubarb, tea leaf, and spice, with hints of flowers and earth, medium body with a lively mouthfeel and finish. The “Red Piano” blends feature a field blend of the varieties at the home ranch. The 2011 – my favorite of the two vintages – showed a peppery and herbal character along with bright red and black fruits and a touch of vanilla/oak, plenty of structure, and fairly grippy tannins, while the 2012 had riper fruit aromas along with more earthy, leathery notes, sweet oak, and a firmly tannic finish. Founded in 1973, Pacheco Ranch is the oldest winery in Marin – the estate vineyard was first planted in 1969. They’re located in the warmer eastern side of the county near Novato, and specialize in Cabernet Sauvignon from their dry-farmed estate vineyard. Owner and vineyard manager Herb Rowland is the great-great-grandson of Marin pioneer Ignacio Pacheco, while his brother-in-law Jamie Meves is the winemaker. Herb and his wife Debbie were behind their winery table and poured me four of their wines – 2006 Estate Cabernet Sauvignon, 2006 “Reserve” Estate Cabernet Sauvignon, 2005 Estate Cabernet Sauvignon, and 2007 “Reserve” Estate Cabernet Sauvignon (pre-release). The wines are typically aged two to three years in barrel and another two in bottle prior to release. The 2006 was the first “Reserve” bottling, made with fruit from specific vineyard rows and vinified separately. The regular 2006 Cab had more tart fruit and earth, with a grippy finish, and I preferred the “Reserve” – this showed a bit riper fruit with a bigger herb component and more structured mouthfeel. The 2007 displayed riper upfront fruit with more spice and sweet oak but less herbal notes, and fine tannins. The standout of the group was the 2005 Cabernet – lots of herb and black olive aromas plus currant and plum fruit, earth, spice and touches of pepper and vanilla/oak, with good structure and refined tannins with a long finish. These are definitely “throwback” style Cabs – a bit rustic and in a lighter style than many from California. 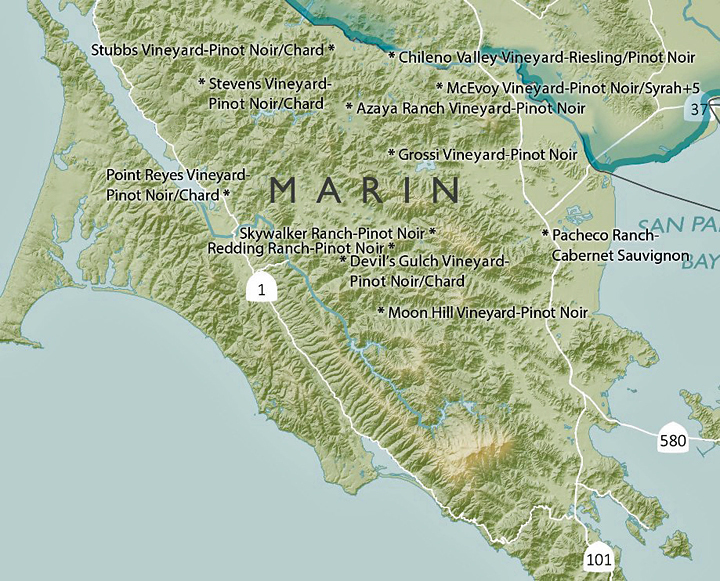 The Pey-Marin label was established in 1999, and it focuses exclusively on wines from Marin County fruit. 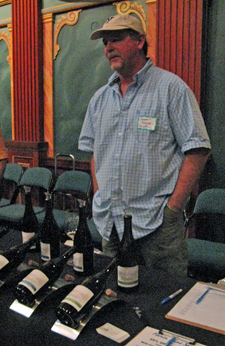 Owner/winemaker Jonathan Pey produces two Pey-Marin bottlings each year, a Riesling and a Pinot Noir. The label is just of several under Jonathan’s Scenic Root Winegrowers umbrella – there’s also Textbook, Spicerack, and The Forager. Jonathan poured me both of the current Pey-Marin releases – 2015 “The Shell Mound” Riesling and 2014 “Trois Filles” Pinot Noir. The Riesling fruit came from dry-farmed Chileno Valley Vineyard, and the wine was made in stainless steel with no malolactic fermentation. With floral and stone fruit aromas, zippy acidity, and a bright, crisp, and totally dry finish with a hint of wet stones – a standout. The fruit sources for the Pinot Noir tend to change a bit from year to year, and the 2014 was entirely from Chileno Valley Vineyard. The wine was made with 25% whole-cluster fermentation and aged in 40% new French oak. Red cherry, earth, flowers, and a touch of sweet oak on the nose, with medium body and a seamless texture, finishing with fine tannins. Pey-Marin’s distinctive Riesling has been a favorite over the years, the Pinot continues to be among Marin’s best. Proprietors Steve and Sharon Doughty planted Point Reyes’ estate vineyard with Chardonnay and Pinot Noir in 1990, less than a mile from the shore of Tomales Bay in the western reaches of Marin County. Their winery tasting room, just off Highway 1, was the first one in Marin since the 1930s. Steve was on hand at the event and poured me three wines – NV Estate Blanc de Blancs, NV Estate Blanc de Noir, and 2005 Quail Hill Vineyard Cabernet Sauvignon. Sparkling wines from their estate vineyard have long been one of Point Reyes Vineyards’ specialties. The Blanc de Blancs is entirely from Chardonnay, and spent six years in bottle – bright, earthy, and yeasty. The Blanc de Noir is 100% Pinot Noir and displayed yeasty strawberry aromas with fine bubbles – of the two sparklers, I preferred the Blanc de Blancs. The winery’s Cabernet Sauvignon is sourced from Quail Hill Vineyard near Terra Linda in the eastern part of Marin, planted in the 1960s and purchased by Steve and Sharon in 1995. Aged in both French and American oak plus an additional three years in bottle, this wine featured herb and green olive aromas along with currant and darker berry fruit, earth, and spice and oak in the background, with a structured mouthfeel and firm tannins. Quite a nice “old school” Cabernet – on the rustic side but with promise for future development. Perhaps Marin’s most iconic vintner, Sean Thackrey has been making his wine in the West Marin town of Bolinas since 1981. He’s known for employing unconventional winemaking techniques learned from old texts, some dating to ancient times – letting his fruit “rest” for up to two days before processing it is a noted example. 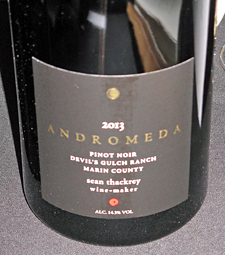 One of many interesting varietal and blended Sean Thackrey wines, the Pinot Noir is sourced from Devil’s Gulch Ranch near Nicasio, and I tasted two vintages of this wine at the event – 2013 “Andromeda” Devil’s Gulch Ranch Pinot Noir and 2012 “Andromeda” Devil’s Gulch Ranch Pinot Noir. Both wines had loads of spice character upfront, with fruit playing a supporting role. The 2013 showed earth and plummy fruit, with a moderately rich mouthfeel and finish. I preferred the 2012 “Andromeda” for its added notes of dried herbs and wet stone, plus more structure and a lively finish. Beginning in 2003, 26 acres of estate Chardonnay & Pinot Noir vines were planted at Skywalker Ranch in the hills near Nicasio. Scott McLeod, well-known for his work at Napa Valley’s Rubicon Estate, is the winemaker. Beginning with the 2012 vintage, the winery has added a second line of Chardonnay and Pinot called Sommità, at a lower price point than their Skywalker label wines. They’ve also started making sparkling wine starting with the 2014 vintage. 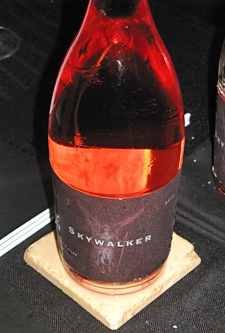 I tasted two Skywalker wines at the tasting – 2015 Skywalker Ranch Rosé and 2013 Skywalker Ranch Pinot Noir. Both are sourced entirely from the estate vineyard. From fruit picked at lower brix, the Rosé featured bright strawberry aromas along with floral and herbal notes, lively acidity, and a crisp finish, quite nice. The Pinot Noir – from 115, 667, 777, and 828 clones and aged in 30% new French oak – showed ripe black cherry fruit, lots of spice, plus earth and vanilla/oak on the nose, a fairly rich and structured mouthfeel, and firm tannins. This is a bigger Pinot compared with most from Marin and will take some time in the cellar to show its best. 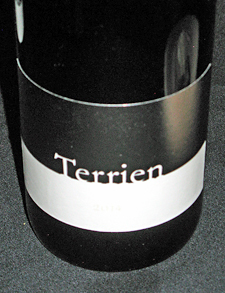 Michael Terrien’s small label is focused mainly on Chardonnay. Their inaugural Pinot Noir release is a bottling sourced from Chileno Valley (Corda) Vineyard. 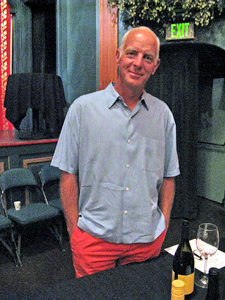 Mark Pasternak, who farms the vineyard, poured the single Terrien wine at the tasting – 2014 Marin County Pinot Noir. Fermented with whole clusters and partial carbonic maceration, the wine was aged for one year in one-year old French oak. Showing its herbal and slightly stemmy whole-cluster character upfront, this also displayed bright red fruit and spice on the nose, with medium-light weight on the palate, good structure, and a stony mineral note on the finish. Perhaps a bit young right now but shows potential for cellaring.